A mixed methods approach was adopted to demonstrate the practical implementation of LEM-LT framework in the evaluation of the eConnect and Learn program (eCAL) (Gopeesingh, 2010) initiated in 2010 in Trinidad and Tobago. The LEM section of the framework was constructed through the lens of the systems level, six design principles and 21st Century skills. 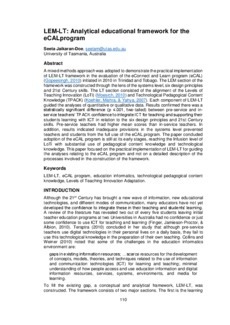 The LT section consisted of the alignment of the Levels of Teaching Innovation (LoTi) (Moesrch, 2010) and Technological Pedagogical Content Knowledge (TPACK) (Koehler, Mishra, & Yahya, 2007). Each component of LEM-LT guided the analyses of quantitative or qualitative data. Results confirmed there was a statistically significant difference (p ≤ .001, two-tailed) between pre-service and in-service teachers’ TPACK confidence to integrate ICT for teaching and supporting their students learning with ICT in relation to the six design principles and 21st Century skills. Pre-service teachers had higher mean scores than in-service teachers. In addition, results indicated inadequate provisions in the systems level prevented teachers and students from the full use of the eCAL program. The paper concluded adoption of the eCAL program is still at its early stages, reaching the Infusion level of LoTi with substantial use of pedagogical content knowledge and technological knowledge. This paper focused on the practical implementation of LEM-LT for guiding the analyses relating to the eCAL program and not on a detailed description of the processes involved in the construction of the framework.